Take Action for Hunger Striking Palestinian Prisoner Khader Adnan! 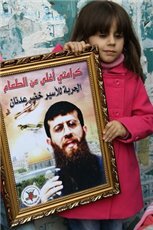 Home Mainpage Take Action for Hunger Striking Palestinian Prisoner Khader Adnan! 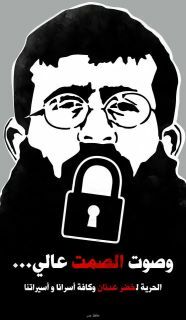 Khader Adnan, an imprisoned Palestinian activist held under administrative detention, has engaged in an open-ended hunger strike since December 17, 2011. Now at fifty days into his hunger strike, he is facing severe health consequences and has been moved to a hospital, continuing to refuse food in protest of torture, isolation, and the use of arbitrary detention against Palestinians. Khader Adnan needs international support and solidarity to make it clear to the Israeli occupation that the eyes of the world are on his case and that of his nearly 5,000 fellow Palestinian political prisoners. He is currently in a hospital bed and being force-fed liquids over his objection. Send a letter now to Israeli officials demanding his freedom. TWEET NOW to share this action alert by clicking here! Addameer, the Prisoner Support and Human Rights Association, details the experience of Khader Adnan with the Israeli occupation on their page dedicated to his case. Adnan, a spokesperson for the Islamic Jihad party, is currently held under administrative detention, which is arbitrary detention without charge or trial, based on secret evidence, and renewable indefinitely for repeated periods of up to six months. Khader Adnan was issued a four-month administrative detention order on January 8. This is the eighth time Adnan has been detained, and he has served a total of six years in Israeli prisons – mostly without charge or trial under the administrative detention scheme. 280 fellow Palestinians are also held without charge or trial under Israel’s administrative detention mechanism. Khader was arrested on 17 December 2011, when Israeli Occupying Forces (IOF) raided his home outside Jenin at 3:30 am. Before entering his house, soldiers used the driver that takes Khader’s father to the vegetable market, Mohammad Mustafa, as a human shield by forcing him to knock on the door of the house and call out Khader’s name while blindfolded. A huge force of soldiers then entered the house shouting. Recognizing Khader immediately, they grabbed him violently in front of his two young daughters and ailing mother. The soldiers blindfolded him and tied his hands behind his back using plastic shackles before leading him out of his house and taking him to a military jeep. Khader was then thrown on his back and the soldiers began slapping him in the face and kicking his legs. They kept him lying on his back until they reached Dutan settlement, beating him on the head throughout the 10-minute drive. When they reached the settlement, Khader was pushed aggressively out of the jeep. Because of the blindfold, Khader did not see the wall right in front of him and smashed into it, causing injuries to his face. Following his arrest, he was taken to interrogation, refused medical care and treatment despite Israeli prison officials’ knowledge of his health conditions, subject to physical abuse and mistreatment including being tied to a chair in a stress position, causing extreme back pain, and pulling on his beard so hard that his hair was ripped out. Khader was subjected to abusive language about his family, and refused to speak any further to interrogators, as well as refusing food. In retaliation, he was placed into isolation and solitary confinement, denied family visits, awakened in the middle of the night and strip-searched. He has refused to end his strike, protesting the illegitimacy of his arbitrary detention by an illegal occupation authority as well as cruel and inhumane treatment and abuse. This is not his first hunger strike – in 2005 he protested his isolation in Kfar Yuna with a 12-day hunger strike. Khader Adnan’s hunger strike has sparked solidarity tents in Gaza and protests in Ramallah. Ten of his fellow prisoners in Ofer prison have joined him in his hunger strike, six fellow Islamic Jihad activists and four imprisoned members of the Popular Front for the Liberation of Palestine; dozens of prisoners have refused food or participated in civil disobedience inside the prisons in support of Adnan. Students in Gaza are organizing a solidarity hunger strike outside the Red Cross building. On Tuesday, February 7, Palestinian lawyers will boycott military courts to protest the treatment of Khader Adnan and demand an end to international silence around his case. Hundreds of Palestinian prisoners participated in a 23-day hunger strike in October 2011, demanding an end to isolation, abuse, denial of family visits, and the long-term isolation of Palestinian leaders such as Ahmad Sa’adat; Israeli promises to end isolation, aimed to secure the end of the strike, proved to be false. Samidoun Palestinian Prisoner Solidarity Network urges the Palestine solidarity movement in North America and around the world to publicize the case of Khader Adnan and raise up the voices of Palestinian political prisoners. Palestinian prisoners’ struggle for freedom is central to the struggle for a free Palestine. Organize a picket or protest outside the Israeli embassy or consulate in your location and demand the immediate freedom of Khader Adnan and all Palestinian political prisoners. Make it clear that the eyes of the world are on the situation of Khader Adnan and demand an end to the use of isolation, torture solitary confinement, and administrative detention against Palestinian political prisoners. 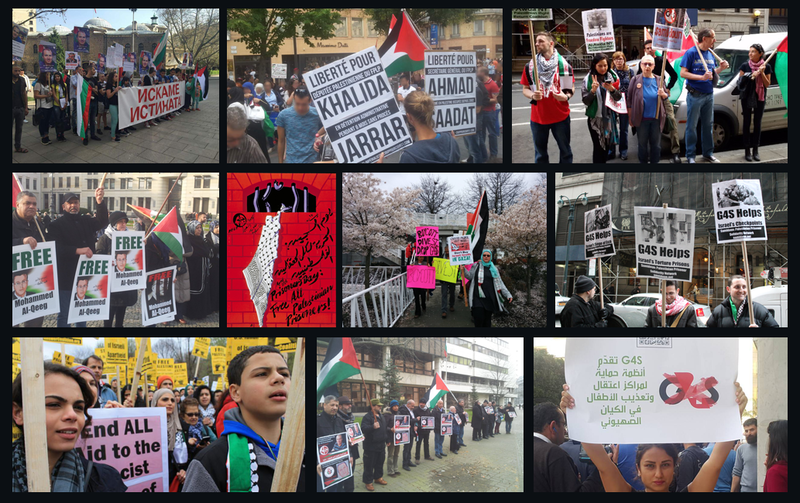 Send us reports of your protests at Israeli embassies and consulates at samidoun@samidoun.ca. Write to the International Committee of the Red Cross and other human rights organizations to urge them to act swiftly to protect Khader Adnan and all Palestinian political prisoners. Email the ICRC, whose humanitarian mission includes monitoring the conditions of prisoners, at JER_jerusalem@icrc.org, and inform them about the urgent situation of Khader Adnan. Make it clear that arbitrary detention without charge or trial is unacceptable, and that the ICRC must act to protect Palestinian prisoners from cruel and inhumane treatment. Share this alert on Twitter and use the #FreeKhaderAdnan and #KhaderAdnan hashtags. TWEET NOW to share this action alert by clicking here.